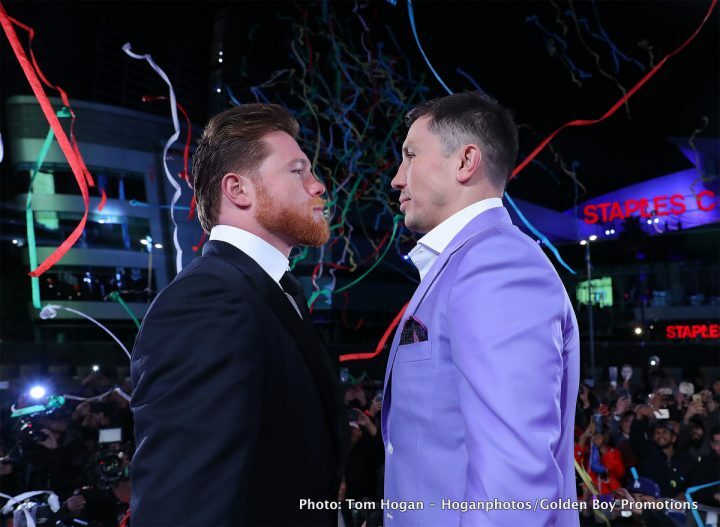 Canelo vs. Golovkin II likely back at T-Mobile Arena in Las Vegas in Sept.
By Dan Ambrose: Saul Canelo Alvarez and Gennady Golovkin will likely be heading back to Las Vegas, Nevada for their September 15 rematch, according to Dan Rafael. The rematch will likely take place at the same venue as the previous one last year at the T-Mobile Arena in Vegas. This is the same venue that Canelo and GGG fought in their controversial 12 round draw on September 16, 2017. The judges turned in a set of scores that didn’t reflect the same fight that the boxing public watched. Overall, the fans unanimously had Golovkin winning the fight. As you would expect, Golovkin (38-0-1, 34 KOs) was angry about draw, feeling like the judges had scored it wrong, and cost him a victory and marred his perfect record. In terms of dollar and cents, the draw likely will hurt Golovkin in a huge way when it comes to his promoter Tom Loeffler negotiating the rematch with Canelo and his promoters at Golden Boy for September 15. ”I am quite confident it will in September back at T-Mobile, scene of the crime,” Rafael said during his chat at ESPN. Golovkin will not be going into the negotiations with Canelo as the winner of the previous fight. Instead he and Loeffler will be going into the negotiations having fought to a tie with Canelo. The tie is only because of the questionable scoring by judges Adalaide Byrd, who scored it 118-110 for Canelo, and Don Trella, who scored the fight a draw at 114-114. The Canelo-Golovkin II rematch still needs to be renegotiated for September 15 despite the fact that they already had the rematch done for May 5. The terms might be a little different with Canelo coming off 2 positive tests for clenbuterol. You can argue that Golden Boy won’t be in such a strong position in the negotiations as they were before due to Canelo being suspended after his positive tests for the banned substance. Canelo tested positive for clenbuterol twice last February while preparing for a rematch with Triple G on May 5. That positive test has tainted what Canelo’s 12 round draw even more than it already was. Now many of the boxing fans not only think Canelo was given a draw in a robbery against GGG, they also think he was using clenbuterol to gain an advantage. Canelo blamed the two tests on having eaten contaminated beat. The Nevada Commission still gave Canelo a 6-month suspension anyway. Canelo posted a photo of himself this week on Instagram, and he looks considerably less muscular and defined as he was in the Golovkin fight. Boxing fans are already looking at the photo as proof that Canelo was using PEDs for the first Golovkin fight. They say that Canelo isn’t extremely muscular like he was during the GGG fight. It’ll be interesting to see if Canelo puts on muscle and becomes really defined for the rematch like he was last September. Either way, it might not help him whether he’s muscular or not, because he didn’t have the conditioning to fight hard for more than the first one-third if each round. Golovkin was able to wait until Canelo would tire after the first minute of each round, and then he would take over and dominate the rest of the round. The scoring from the judges failed to show Golovkin’s dominance though, which is why the boxing fans were so angry. Canelo was getting away with winning the rounds by fighting only a small portion of the rounds. Boxing » Gennady Golovkin » Canelo vs. Golovkin II likely back at T-Mobile Arena in Las Vegas in Sept.